The Residential Tenancies and Rooming Accommodation Act 2008 (the Act) contains the rules covering rooming accommodation such as boarding houses, hostels, and off-campus student accommodation in Queensland. Rent accrues on a daily basis while the resident occupies the room, or holds the room after ending the Rooming accommodation agreement (Form R18). Providers/agents cannot take or dispose of a resident’s property or goods in return for unpaid rent, other monies owed, or for damage to premises. Penalty provisions apply. The Act lists the following ways rent can be paid: • cash or cheque • bank deposit to an account specified by the provider/agent • electronic funds transfer or credit card, or • payroll or pension/Centrelink deduction. If the provider/agent wants rent to be paid by a way not listed above, two other ways that are listed must also be offered to the resident. The provider/agent must also tell the resident about any costs associated with the way of paying rent that is not listed. By law, residents must pay their rent on time and at the place stated in the agreement. If the provider/agent gives the resident a written notice changing the location where rent is to be paid and it is a reasonable place, the resident must pay at this location. Providers/agents must give residents receipts for all rent payments made in cash at the time the payment is made. Receipts must also be given to residents when payments are made by other methods, if they request a receipt. Receipts must state: • the resident’s name • the address of the rental premises • the number of the resident’s room • the date the payment is received • the period for which the payment is made • the amount of the payment • that the payment is a payment of rent, and • the individual amounts for any services provided such as food or personal care. Providers/agents must keep records of rent payments for at least one year after the agreement has ended. Penalties apply for false or misleading entries made in rent records or for failing to keep records. Rent in advance Residents can only be charged up to a maximum of two weeks rent in advance. Penalties apply if more than two weeks rent in advance is charged. The provider/agent must give at least four weeks notice in writing that rent will be increased. This notice must say how much the rent will increase by and when the increase will happen. Rent may only be increased during a fixed term agreement if the agreement says it can be increased, and how this increase is to be worked out. If the provider/agent prepares a new Rooming accommodation agreement to renew an existing tenancy, provision for an increase in rent at the beginning of the agreement may be made. In this circumstance, there is no need to give four weeks notice as the rent increase is part of a new agreement, not an alteration of the existing one. These rules do not apply if the resident and provider/agent agree to vary the rent required because there has been a change in the services they provide. This can happen without issuing notices. Rent decreases Rent may be decreased because: • there is a drop in the standard of the room or service • there is a decrease in services provided • the resident is not receiving a personal care service because they are away • the resident is not receiving a food service because they have been away for more than two weeks. If the resident and the provider/agent cannot agree about the decrease, either may apply to the RTA’s dispute resolution service for assistance. Rent arrears are to be dealt with in accordance with the Act, adhering to notice periods and issuing notices. If a resident is behind in their rent payments, the provider/agent can issue a Notice to remedy breach – Rooming accommodation (Form R11) immediately if the resident has been there for less than 28 days. However, the Act states that if the resident has been there for more than 28 days, a notice can not be issued until the rent has remained unpaid for two days. When the provider/agent issues a Notice to remedy breach – Rooming accommodation for not paying the rent, the resident must be given time to pay the rent owing: • if the resident has been living in the accommodation for less than 28 days, the provider/agent must give them at least two days notice to pay the rent • if they have been living in the accommodation for more than 28 days, the provider/agent must give them four days notice. Rooming accommodation (Form R12) may be issued if the resident has not paid the rent by the due date on the Notice to remedy breach. A lessor/agent may ask a prospective tenant to pay a key deposit to enable them to enter and inspect premises. When taking a key deposit, the lessor/agent must give a receipt, and ensure the deposit is fully refunded upon return of the key. Prospective tenants may be asked for a deposit to reserve or hold premises they intend to rent. However, the lessor/agent can only accept a deposit from a prospective tenant if a copy of the proposed agreement and any bylaws or park rules have been given to the tenant. Under the Act, the only deposit that can be taken from tenants at this stage is a holding deposit (application deposits are not allowed). The time period for which a holding deposit will apply is negotiated between the prospective tenants and the lessor/agent. When a period is agreed, it should be written on the receipt for the deposit. If no holding period is stated on the receipt, the Act states that the period is 48 hours. The lessor/agent can only take one holding deposit at any one time for the property. On accepting a holding deposit, the lessor/agent must give a signed receipt and ensure the property is available if the person proceeds with the tenancy. If the prospective tenant does not proceed with the tenancy and advises the lessor/agent within the holding period, the entire holding deposit must be refunded within three days. The lessor/agent can keep the holding deposit if the prospective tenant fails to notify the lessor/agent of their decision not to go ahead with the tenancy within the agreed holding period. If the prospective tenant indicates that they will proceed with the tenancy but then fails to enter into the tenancy agreement, they will forfeit the holding deposits When a tenant signs a tenancy agreement after paying a holding deposit, the holding deposit becomes part of the rental bond. Any surplus amounts then become rent in advance. If I don’t like the property what is the refund policy? You are bound by the Residential Tenancies Agreement. Genesis1Student Accommodation will endeavour to work out any issues with you within the guidelines set out by the Agreement. If I pay the deposit and my visa is denied, will I get any refund? Genesis1 Student Accommodation will review your individual circumstance in order to determine the most appropriate outcome If you notify us prior to 14 days before the start of the agreement. It will be within the guidelines set out by the Agreement and current Residential Tenancies legislation. The Residential Tenancies and Rooming Accommodation Act 2008 (the Act) provides rules for collecting rental bonds in rooming accommodation, such as boarding houses, hostels, and on and off-campus student accommodation in Queensland. A rental bond is money paid by the resident to the provider/agent at the start of the Rooming accommodation agreement (Form R18), as financial security in case the resident breaches the terms of their agreement. A key deposit is considered a rental bond. It is not compulsory to charge a rental bond. Where a rental bond is charged, the provider/agent must lodge it with the Residential Tenancies Authority (RTA) within 10 days of receipt. If the provider/agent receives the rental bond by instalments, different rules apply. All initial rental bond payments to the RTA must be made with a completed Bond lodgement (Form 2). If the weekly rent is $500 or less, then no more than four weeks rent can be charged as a rental bond. There is no bond limit where the weekly rent is more than $500. If a rental bond is charged, a Condition report – Rooming accommodation (Form R1) must also be completed. How is bond money refunded? See below for a chart outlining how the RTA deals with bond refunds. Disagreements may arise between residents and providers/agents about rental bonds. Residents and providers/agents can usually resolve their disputes by talking to each other and finding out about their rights and responsibilities under the Act. If this does not work, the RTA’s dispute resolution service may be able to help. 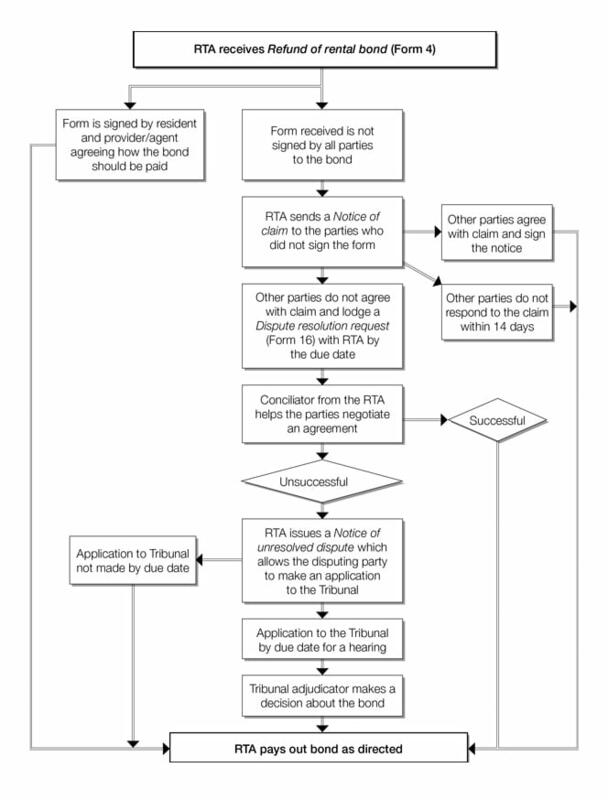 If the resident and the provider/agent still cannot agree after dispute resolution, an application may be made to the Tribunal for a decision.